When “The Hunger Games: Mockingjay – Part I” comes out this weekend, it should do something no other film this year has been able to do — make well over $US100 million opening weekend. So far, there has only been one movie in 2014 that has had a $US100 million opening weekend. That was Paramount’s “Transformers: Age of Extinction,” the fourth instalment of Michael Bay’s ongoing franchise back in June. 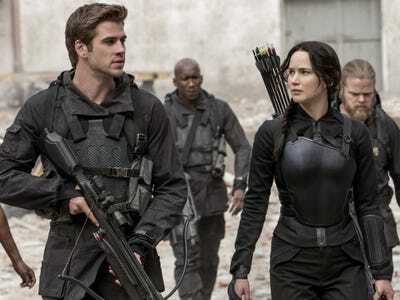 2012 had four movies debut to over $US140 million (“The Avengers,” “The Dark Knight Rises,” “The Hunger Games,” and the final “Twilight” film). The last time we’ve only seen only two movies open above $US100 million opening weekend was in 2009 when “The Twilight Saga: New Moon” ($US142 million) and “Transformers: Revenge of the Fallen” ($US108 million) came out. What’s the deal with 2014? For one thing, more movies have debuted in the $US90-$US100 million range than previous years. Those five films include “Godzilla,” “Guardians of the Galaxy,” and sequels “Captain America 2” ($US95 million), “The Amazing Spider-Man 2” ($US91 million), and “X-Men: Days of Future Past” ($US90 million). There also weren’t as many event films. Next year, we’ll have “The Avengers” sequel, the final “Hunger Games” movie, and a new “Star Wars” film. “Fast and Furious 7” was originally set for a July 2014 release but was pushed back to April 2015 after the death of Paul Walker in late 2013. The last sequel, “Fast 6,” made $US120 million opening Memorial Day Weekend. “Mockingjay” has been one of the most anticipated movies of 2014. Tickets for the sequel have been on sale since the end of October. After tickets went on sale, both Fandango and MovieTickets.com reported the movie had the largest first day advance ticket sale of the year. The film accounts for over 90% of Fandango’s ticket sales this weekend. BoxOffice.com estimates the film will debut to $US150 million. A quick look at the film’s two previous openings shows “Mockingjay” could and should easily open higher.